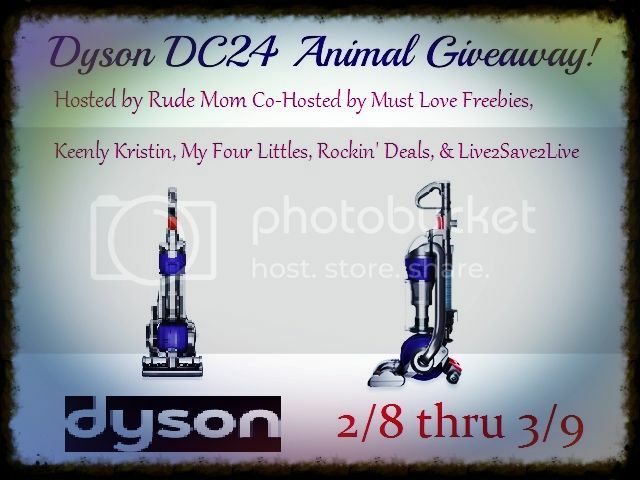 Welcome to the The Dyson DC24 Giveaway hosted by Rude Mom! Co-Hosted by Must Love Freebies, Keenly Kristin, My Four Littles, Rockin' Deals, and Live2Save2Live! One LUCKY winner is going to receive the Dyson DC24 Animal Vacuum cleaner valued at $449.99!! I have a Dyson and I love it! It really works great and I have taken great care to make sure it stays in tip top shape. I haven't, but I want one SO BAD! Not yet. I want one though. Yes, I have one now, but would love to own another so I don't have to carry it up and down the stairs! I'm only getting older and it's killing my back, but we can't afford to buy another one! I've never owned one, but always wanted one! no, but i used one and love it! No, but I would love to own one. No but I really really want one!! I have never had a Dyson before. I so desperately need a vacuum. This would be a tremendous help! No I have not owned a Dyson before...but I would love to have one! I haven't owned one, but the one I have is on it's last leg. No, I have never owned a Dyson, but I sure would like to. I have never owned a dyson but have wanted one since getting hardwood floors and having a dog and 2 cats. no but would love to use one. No i have not but I have always wanted to. No I have not but I have always wanted one. No I haven't but I would love to have one. I have used one at a dear friend's house and then we got a steal of a deal on one last year. No, But I would LOVE to try one! No, But I would soo LOVE to! I don't own one, have never owned one, but have always wanted one! I never have owned one but have used one at my Mom's. No but I would love to win one! I sure have and I loved it. no but I want one Really bad. i have and it recently died after 1o years of really hard use. I did but it recently died, it was well loved you can say now we are without a vaccuum. I would love to win a Dyson DC24, it would make my life easier. Unfortunately I have never owned a dyson. Wish I did, my Parents have one and love it! thanks for the opportunity to win! Good Luck Everyone! Haven't owned one but I've used one. Dyson is awesome! I have never owned one, but have used a couple at friends houses and I want one!!! I've never owned a Dyson. No, but I have a dog and four cats and would love to try one. I have always wanted a Dyson Animal, and have never owned one. I have never owned a Dyson, but it would awesome to win one!